Sound waves are pressure waves that have a specific frequency and velocity capable of penetrating tissues which can be controlled to exert therapeutic effects. 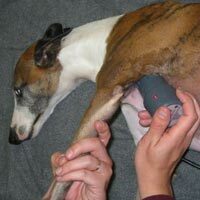 The therapeutic effects of ultrasound can be thermal, which heats the tissue and increases circulation to the area, creating a mild localized inflammatory response. Alternately, the effects can also be non-thermal, causing mechanical effects (i.e. bumping of the cells into one another, which can help with increasing cellular activity and nutrition).